Beijing: Long before he courted controversy for his Australian political donations, high profile Chinese Australian businessman Huang Xiangmo had a track record of making multi-million dollar donations in his home city of Jieyang, in southern China. Two days ago, the former mayor of Jieyang, Chen Hongping, received a suspended death sentence for corruption and accepting 140 million yuan ($27 million) in bribes. He faces life in prison, with all of his property confiscated. Chen stepped down as mayor in 2011, shortly before a corruption investigation into his eccentric projects, including a vast tomb built on feng shui principals, and a city tower, began. Mr Huang moved to Australia the same year. Before Chen’s downfall, Mr Huang openly discussed the large donations he had made to the city at Chen’s request. Mr Huang donated 60 million yuan to the town in 2009 to build a grand city gate after Chen directly asked Mr Huang for the money. Mr Huang believed Chen was embarrassed to “raise this issue and ask for ‘donation’ from a business owner, and he was not doing this for his political performance”, the report said. Mr Huang transferred 10 million yuan to the city’s bank account within four days, and later, another 50 million yuan. The Yuhu Group website describes how Chen and Mr Huang together visited the construction site for the tower in January 2009, and its completion ceremony in July 2009. In 2011, Mr Huang donated another 80 million yuan for the city to build a Bodhisattva pavilion. Mr Huang had told the town’s newspaper, before he moved to Australia, that he donated such large sums for charity, and asked for nothing in return. “I will never do business with charity. Because return to home and return to society is not give and take, there should not be any additional conditions,” he told the newspaper. The Guangdong newspaper part-owned by another high profile Chinese-Australian political donor, Chau Chak Wing, covered the verdict on Tuesday. The New Express Daily reported that between 2004 and 2011, Chen used his position as Jieyang mayor and party secretary to seek benefits for others and accepted property equivalent to 139 million yuan. In 2011, he sought illegal interests for others, abusing his power. Chen was arrested in 2013, and Fairfax Media has previously reported that the prosecutor’s indictment included the allegation that Chen erred by overspending on the city gate. There is no suggestion Mr Huang’s contribution toward the Jieyang Tower should be construed as a bribe. Mr Huang has told Fairfax Media previously that he was never mentioned by name in the prosecution’s indictment. Another Jieyang businessman who donated to the tower was sentenced to two years and 11 months’ jail, after Chen told the court in a separate trial he had been given 95 million yuan by the businessman but it wasn’t a bribe. He’s one of Australian politics’ biggest mysteries. 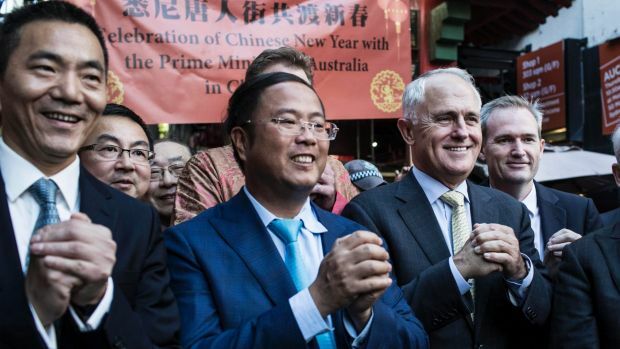 He’s been photographed with nearly all the nation’s political leaders, channelled more than $1 million into the back pockets of the major parties and backed Bob Carr’s China institute at UTS. He’s paid Senator Sam Dastyari’s legal bills, hired former NSW deputy premier Andrew Stoner and former treasurer Eric Roozendaal, he’s the head of the oddly-named “Australia Council for the Promotion of Peaceful Reunification of China” and been dubbed the “king of the mountain” after several wealthy Chinese bought around him after he spent $12.5 million on a lavish mansion in Mosman. Now, in an exclusive first English-language interview, the man who is arguably the reigning emperor of the Chinese community in Australia, Huang Xiangmo, wants to shed his enigmatic image. “You can ask me anything, see I’m no mystery!” the 47 year-old says. For a relative newcomer to Australia, Huang has made a big splash in the Australian Chinese community in a short time. Having arrived in 2011, he’s gone from new kid on the block to being the man who officially welcomed the new Chinese ambassador this year. Now he’s at the centre of a hot debate about how the Chinese community is funding Australian political parties – and why. We meet for lunch at The Century at The Star casino, an upmarket Chinese restaurant in Sydney’s Pyrmont. A severe maître d’ ushers me through the main dining room and down a dimly lit passage to a private room where Huang is deep in negotiations with a tall Chinese waiter. As is the done thing at business lunches in China, as host Huang is deciding the full and diverse spread in advance. I’ve barely said “Nin hao” in my rusty Mandarin before the real estate developer is ordering a bottle of French wine. Speaking over the clamour of plates and chopsticks as we enjoy deliciously crisp duck pancakes, Huang is keen to play down the importance of the political donations from himself, his various companies and their staff. Those comments are somewhat at odds with Huang’s more recent remarks on the same subject. In an editorial for the Global Times newspaper, Huang suggested the Chinese community would increasingly demand a greater say in Australian public life after being used as a “cash cow” by both sides of politics then ignored. Huang’s comments were not well received in Australia and the subsequent English language translation was heavily watered down. His spokesman has subsequently said he “expected absolutely nothing in return for donations”. Back at the lunch held a few weeks ago, he’s bemused. “I find it very curious that I support far more charity here than in China yet I never get any media attention compared to my very modest political donations,” he says. Modest though it might be for Huang, he is one of Australia’s largest political donors. But he says he has received no benefit from his contact with politicians. “I don’t receive any benefit from any of the free trade agreement,” he says. As for the legal bill of more than $40,000 he paid for NSW Labor Senator Sam Dastyari in 2014, and which has had Dastyari on the front pages this week, Huang insists they are just friends and subtly reminds me of his wealth. Huang, who says he has donated more than $80 million to charity in both China and Australia – hails from Jieyang in the economic powerhouse province of Guangdong in south-east China. It’s the same city as his fellow prominent Australian-Chinese businessman, Chau Chak Wing. Chau is also a generous donor to Australia’s political parties, though he’s probably best known for the $20 million he gave Sydney’s University of Technology towards the Frank Gehry-designed business school. As with many Chinese of his generation, Huang grew up in what he describes as a humble and ordinary family. His father died when he was very young. Huang studied economics at the Guangdong Academy of Social Science and went on to hold senior managerial positions with the state-run China Railway Group. In 2001 he founded the Shenzhen Yuhu Investment Development Company. Over the following decade in Jieyang Huang’s business prospered. 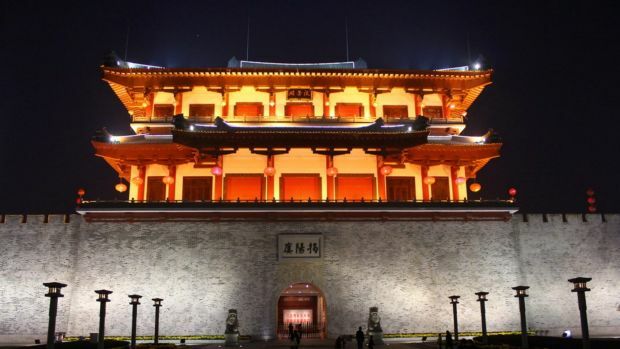 In 2009 he even gave 150 million yuan ($32 million) towards a monumental, pagoda-style city gate that was the pet project of his friend, Communist Party secretary Chen Hongping. The Sydney Morning Herald reported earlier this year that he made a “hurried” exit from China to push ahead with plans to expand his business to Australia when it became apparent he might be the subject of an investigation, now commonplace in the superpower. However Huang vigorously denies this and says he made the move purely to take advantage of business opportunities and – like many others seeking relief from the smog – a better lifestyle in Australia. In 2012 Yuhu Group (Australia) was established in Sydney and built up a property portfolio centred on Sydney’s CBD. It owns two shopping centres and an office tower in Sydney, while its flagship project, a luxury office-to-residential conversion called The Miller in North Sydney, is in the pre-construction sales stage. The dishes keep on coming, with plates of cod and noodles next up. As we discuss the $3 billion investment fund he set up in 2014 with Chinese state-owned Beijing Agricultural Investment Fund, Huang subtly reveals a shift of direction that will come as more bad news for struggling dairy farmers. Rather than investing in dairy to supply infant formula to China, the fund will focus on grain and fisheries because Chinese people are now prepared to buy dairy from their own farms. But when it comes to influence, it’s Huang’s interest in Australian universities that is arguably more telling than his property, agriculture and political investments. Huang paid for UTS to set up a research centre on campus – the Australia China Relations Institute – which is seen as friendly to Beijing. Asking about how involved he is, he says he personally appointed Bob Carr to his post as the institute’s director – but he wasn’t the only name in contention. “When we established the institute ACRI someone recommended an even more influential figure from politics to me but I decided to invite Bob Carr because I consider him to be a very good academic,” Huang said. 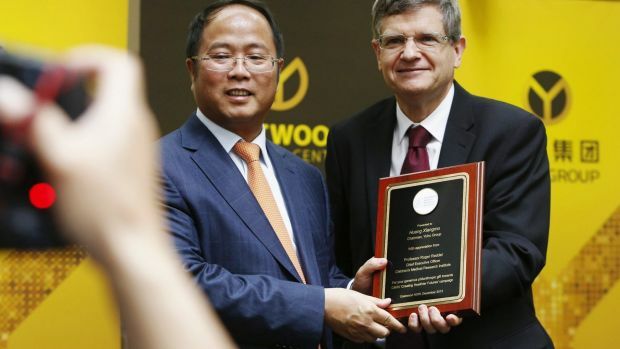 Huang has also pledged $3.5 million for a Chinese studies centre at Western Sydney University. Just as I thought I could hardly eat another thing, deep fried twigs of squid emerged after a soft knock at the door from our second waitress. Conversation shifts to the other arm of influence Huang has established, The Australia Council for the Promotion of Peaceful Reunification of China, which is supported by a number of current and former politicians and is dogged by claims it’s directly backed by China’s Communist party. As our lunch comes to an end Huang tells me he’s keen to stay in Australia for the long haul, “probably spend the rest of life”. As the melon triangles arrive it’s clear his mission is ever expanding – and I can’t escape without being recruited. And after that it’s time to go. We are whisked out and a Rolls-Royce promptly scoops Huang up. Huang Xiangmo paid for the meal.